Biggest mistake you made in your previous season: Getting lost in Oman. Most memorable moment from your first Race: It was very memorable getting second three legs in a row. It was nice in Norway and Sweden because we had a comfortable lead and could relax a little and look around. Favorite place you visited on your first season: St. Petersburg, Russia. It was a beautiful city with great people. Plus, it wasn't 100 degrees outside. Why do you want to run the Race again? All of the same reasons as before except we want to win this time. How have you changed since the last time you competed? I'm better prepared physically and mentally. What are you passionate about? My family, my work, my faith, fitness and now, The Amazing Race! People would be surprised to learn: I ran 13 marathons and a half Ironman triathlon after I turned 45. One location that you hope to go on this adventure: Australia Â– I've never been and I like the spirit of the people that I have met from there. Biggest challenge you and your teammate will face on the Race together: To relax and enjoy the moment and not miss the beauty of what we are running through. What do you hope to accomplish by running the Race again (other than winning one million dollars): Meet new people, see new places and be the last team standing. Pet peeve about your teammate: She talks too much. What would you do if you won the million dollars? Give it away. Any strategic changes you will make heading into this Race: Let Mallory drive more. She is a more aggressive driver and I am a better navigator. We are also only going to bring one backpack with less than twenty pounds for both of us. Biggest mistake you made in your previous season: Not turning around earlier in Oman. Most memorable moment from your first Race: Finishing the bicycle rim challenge in Ghana and moving from last place to second place. Favorite place you visited on your first season: I loved the Arctic Circle, especially the first half in Sweden. We were so hot and tired after racing two legs in Ghana, so the weather was perfect. I loved the snow. Why do you want to run the Race again? I want to continue what we started last season and make it to the end. I also want to be the first parent-child team to win. How have you changed since the last time you competed? It hasn't been that long, but my occupation has changed. I was the reigning Miss Kentucky during the last race, but my year of service has ended so things aren't as crazy and hectic this time. I am able to focus more on the Race and I've grown even more excited about it this time. What are you passionate about? Performing, my family, my faith and striving to be a positive role model. One location that you hope to go on this adventure: Australia! I've never been, but I know I would love it there. I think my dad and I would fit right in with the people there. Biggest challenge you and your teammate will face on the Race together: To enjoy it more than we did last time. That will be a challenge because we loved it so much. We also need to work on our patience with each other. What do you hope to accomplish by running the Race again (other than winning one million dollars): I hope to see my dad standing proud and fulfilled at the finish line. Pet peeve about your teammate: My dad is laid back and moves a little slower than me. My pet peeve is when he takes a long time to get his thoughts out and I'm already onto the next thing. What would you do if you won the million dollars? I would give some of it to the Catholic school that I attended growing up. I would use the rest of the money to begin my life and career. Any strategic changes you will make heading into this Race: I need to let my dad navigate more. He's definitely better at that. We also need to remember how strong we are. They deserve to win this time! A huge LOL at CBS for having the same Gallory Picture except Mallory has a pink shirt.. I can't wait for Mallory!! It's awesome and I know they are deserved!! I hope Mallory will make it in F3.... Go Mallory!!! Gary too! Gary + Mallory = Gallory! I noticed that too. Was it really edited? I love Gallory! Hope they win this time! They're like the David and Mary of TAR Allstars. The fact that they're on is because they're a team from the latest season.. and i'm glad we get to see them because they definitely deserved another chance. And i loved David and Mary too! new video in 1st post. We are also only going to bring one backpack with less than twenty pounds for both of us. Less than 20 pounds! They're sure going damn light this time round! Why don't I think that will be 10 pounds each? After traveling 32,000 miles over 4 continents, 10 countries and 30 cities, most people would be perfectly happy to stay home, but when Gary and Mallory Ervin returned from The Amazing Race, they had unfinished business. The whole world watched them fight flat tires, castle walls, cow manure, broken taxis, and television antennae, wondering when their energy and positivity would run out. Every Monday morning, talk turned to how Team Yellow performed on Sunday night’s show – at least in Union County, it did. “It was a once in a lifetime experience, who’d have thought we’d ever get a second chance,” Mallory said in their first press interview with the Advocate. Before the rest of us even started watching their adventures on television, Gary and Mallory had been called back to compete in Season 18 of The Amazing Race. Starting on Feb. 20, “Unfinished Business” airs on CBS channel 44. This season opens at the San Gorgonio Pass Wind Farm near Palm Springs, California. The first task is to sift through hundreds of paper airplanes to find the one labeled “Queensland and Northern Territory Aerial Services,” the full name of Qantas Airways, and win two tickets to Sydney, Australia. After Sydney their travels will include the Australian Outback, Japan and Liechtenstein. “It’s really much harder than it looks on TV, and this season they intentionally made it crazy hard,” warned Mallory. If their first season on The Amazing Race was heart-stopping and nail-biting, be prepared for an even bigger adrenaline rush this time. Mallory and Gary are joined this season by ten other teams of past competitors, five teams from Season 14 alone. Audience favorites Jet and Cord, also known as “The Cowboys” are back, as are Flight Time and Big Easy from the Harlem Globetrotters. “This season is another good cast, but there are definitely some game players. Some teams were brought back because they bring drama with them,” warned Mallory. What else will be returning for Season 18? Gary’s Union County wrestling t-shirt, yellow bandanas, and Mallory’s prayer bracelet. Plus look out for their pins that support Autism Awareness, Kentucky Proud, and Friends of Coal. Having just finished a season of Amazing Race, they feel they have an advantage, both mentally and physically, over the other teams. They can remember how to pack and how to survive the grueling challenges. While a lot of Season 18 competitors carried ten or more pounds of food in their backpacks, Gary and Mallory did not, knowing that they will be able to fill up with food on flights or forage at hotel buffets. Both consider their father-daughter relationship to be their greatest strength, even though they might argue, it all comes down to being family. “I mean, he’s my Dad. I’m not going to break up with him,” Mallory said, smiling. Another advantage they have is fearlessness. Neither has any debilitating phobias that have plagued other competitors, like fear of heights, claustrophobia, or arachnophobia. The only thing they are afraid of is being eliminated from the Race. They are equally matched physically and mentally, so they share the responsibilities of both categories of challenges. “But Mallory still has more energy than me,” Gary admitted. There are also teams working on each challenge, and the producers would hire local people whenever they could. Season 18 has more medical treatments than Season 17, with the medical crew taking competitors to hospitals for stitches and hypothermia. Mallory assured that safety is a very high priority, because “it wouldn’t look too good” for anyone to be seriously injured. Because they left to start Season 18 the day after the episode when they were eliminated from Season 17 was aired, Gary and Mallory missed the outpouring of sympathy from Union County. “It’s like they’re running the Race with us, and I think that’s the most special thing about our small community,” she said. Once again, Mallory and Gary will be signing yellow bandanas to raise money for charity. They are available from Bud’s County Corner and Creative Touch in Morganfield. Mallory has also made some prayer bead bracelets similar to the bracelet she took with her on Season 17, which are available at Horsefeathers in Morganfield. Proceeds from bandana and bracelet sales will go to Downtown Morganfield, Inc, and to make care packages for Union County soldiers overseas. “I was also impressed by the way Mallory always showed respect for her father in the hard times of the game. They were a team, not two separate people with two separate agendas,” added Judy Owen of Clay. At first, Mallory Ervin couldn’t believe the CBS producer’s phone call. She and her father, Gary, had just returned home to Morganfield after competing on season 17 of “The Amazing Race.” And they were being asked back for another season. “She answered for me, but she knew that we wanted to do it again,” Gary said. The show’s 18th season, titled “Unfinished Business,” features former competitors — teams of two people — from throughout the show’s long history. It premiers this Sunday at 7 p.m.
Mallory and Gary have received significant attention from their small community since their first “Amazing Race” appearance, in which they placed sixth. “My dad always says ‘It takes a little longer to get through Wal-Mart now,’” Mallory said. But she isn’t exactly new to being in the spotlight. In 2009, she was crowned Miss Kentucky and went on to place as fourth runner-up in the 2010 Miss America Pageant. Racing from country to country, the Ervins were briefly immersed in dozens of different cultures. Few, including the competing teams, were familiar with Morganfield. But everyone seemed to be an expert on one statewide subject. Mallory and Gary had a short period of time to prepare for season 18, but were focused on training at a more difficult level. They exercised harder, packed lighter and ran farther. The training may have helped, but Gary revealed that there were some habits of Mallory’s that she could not control during the competition. “She talks too much,” he said in a previous interview with CBS. Gary explained that his daughter would often, and willingly, give hints and offer help to other competitors. Luckily, he added, it ended up that it “helped more than it hindered,” referring to the social aspect of the race. “You wanted to make sure you’re liked, and she spoke and she helped a lot of people. So, they kind of owed us, which doesn’t really mean they returned the favor,” Gary said. “If someone asks me for help, I can’t tell a lie. I can’t not give them the information. Maybe that’s from being from a small town and having too big of a heart,” she said, blaming her father for her talkative tendency and honest nature. Throughout their travels, however, the Ervins’ Kentucky-size hearts were introduced to some upsetting scenes. Between flying across the world and searching for their next clue, the Ervins felt they barely had time to notice and appreciate their surroundings. Mallory urged future competitors not to make the same mistake. “Look around and enjoy it. You’re out traveling the world. What are the chances you get to do something like that,” she said. The Ervins consider themselves fortunate for having the opportunity to share another adventure as a team on the show. © 2011 Evansville Courier & Press. All rights reserved. This material may not be published, broadcast, rewritten or redistributed. Keoghan explains the show's picks below. I love how Phil gives a nod to Mallory's positive energy while not forgetting about Gary! They'd barely unpacked their backpacks when the call came offering Gary and Mallory Ervin a second shot at winning The Amazing Race. "It kind of dampened the blow of watching us get eliminated from the first one," said Gary Ervin, half of the Western Kentucky father-daughter duo that came in sixth in the most recent season of CBS's globe-trotting reality competition. Sunday night, just three months after their last episode aired, the Ervins will be back on TV when The Amazing Race: Unfinished Business premieres. The new season, the Emmy-winning show's 18th, gathers 11 non-winning teams from previous seasons for a second chance at the $1 million grand prize. The Ervins, of Morganfield, are the only team from last season. They are one of three with strong Kentucky connections (see below). Mallory, 25, thinks that the way the pair were eliminated (they had an incorrect map of the Arab nation of Oman) might have helped them get another shot on the show. The highly competitive team — he's a businessman, she's a former Miss Kentucky — had done well until that point, she said, and people realized they had the potential to win. It didn't hurt, the producers told them, that they were favorites of the show's fans. Gary, who has watched the show since it began 10 years ago, says he was a little star-struck when he met some of the competition for this round of The Amazing Race, particular the cowboy brothers, Jet and Cord McCoy, and a couple of Harlem Globetrotters, Herb "Flight Time" Lang and Nate "Big Easy" Lofton. "He wanted to get autographs," Mallory said. To prepare for round two, Gary, 53, lost 20 pounds. And both learned how to drive a car with a manual transmission — a perennial hurdle for the show's racers. In a shift in strategy from last season, Dad will do the navigating and Mallory will drive. "She's a more aggressive driver," he said. Unlike some Amazing Race contestants, the Ervins didn't bicker or snipe on the show. For the most part, their time on camera was remarkably free of drama. That doesn't mean they agree on everything. Mallory, who was Miss Kentucky 2009, wanted to pack a hair straightener for the trip. Dad said no. "I told him that I wouldn't take it but he would have to iron my hair," she said. And he did. With an iron. "It didn't have a setting for 'hair,'" Gary said. "I didn't know how hot to make it." "I think you burned it a little bit," Mallory said, laughing. Shooting for the show is complete, but the pair are sworn to secrecy — not only about who won but about any particulars of their global travels. The show's publicity materials say that teams will travel 40,000 miles through five continents and 23 cities and that the first episode begins in Palm Springs, Calif., and takes teams to Australia. Other stops include Liechtenstein and Tokyo. Beyond that, everyone is mum. Gary said family and friends don't pry too much but are eager to see the race play out week by week on television. "They don't want to ruin it," he said. Knowing the outcome would "destroy the excitement." "My dad and I are together all the time. We'll see something that we saw on the race or start talking about having some kind of injury, and my mom will hold her ears and say, 'I can hear you,'" because she doesn't want to know, Mallory said. Gary said that if he ends up winning the $1 million prize, he will give his share to charity. Mallory said she'll also donate a chunk of her winnings. The way they looked at it was "that we had such a gift to do this race two times in a row, the money was secondary," she said. "What we treasure is the experience." They already have donated money from their first Amazing Race winnings to spruce up downtown Morganfield. They also are selling autographed yellow bandanas, like the ones they wear on the race, and Mallory's handmade prayer bracelets. The profits from those sales are being donated to charities that help members of the military; that's in honor of a relative injured in Afghanistan. Their hometown fans have turned the streets of Morganfield yellow with bandanas. "Everybody in our town feels like they are running with us," Mallory said. She said one older fan told her he had to stop watching the show because he was getting too excited and having chest pains. Now that the race is over, the Ervins will watch it on TV. Gary isn't sure what his next challenge will be. Mallory, who had long aspired to pursue a career in theater in New York, is heading instead to Hollywood in hopes of getting into television. She'll stay with friends she met through the show. And, she said, "We are ready for them to call us back for a third time." On TV, former Miss Kentucky Mallory Ervin and her dad, Gary, are trying to traverse the globe as part of The Amazing Race but back home there's one place they can't go: Wal-Mart. "If I want to go, I've got to block out three hours" to deal with all the well-wishers, Mallory said. Such is reality TV fame when you hail from Morganfield in Western Kentucky. The duo made their race debut Sunday, when Season 17 of the race-around-the-world reality competition premiered. They came in sixth on the first leg after contending with a flat tire and driving much of the route through England on the spare "doughnut." How they came to be part of the race is one of those "somebody said something" offhanded comments that grew into an unexpected adventure. After competing in the 2010 Miss America pageant, where she was fourth runner-up, Mallory was looking for a new challenge. One of four children, including a sister who also competes in pageants, Mallory, 24, said it was a no-brainer to team up with her father. Gary, 53, a businessman, said, "I probably watched more of the show than she did. I was always a big fan. I didn't think I would ever have the opportunity to do it." Gary said his daughter's Miss America fame probably helped get a little extra attention for their three-minute audition video, which focused on their love of adventure. But in the end it is probably the father-daughter dynamic that helped them land a spot out of thousands of auditioners. During the lengthy interview process, Mallory said, "they ask you a lot about your relationship." "They spend a lot of time so that they get the right mix," Gary said. After several rounds of interviews, the calls finally came. Mallory got the news while she was in a store fitting room. Gary was in court on a business matter. Neither could tell anyone that they'd made it on the show. "I felt kind of bad because I couldn't act excited," he said. Once the news sank in, they did what they could to prepare. "There was a lot of running carrying 20 pounds on our backs," Mallory said. They also studied up on their world geography. "Just refreshing ourselves both mentally and physically," Gary said. Both agreed that there is no way to totally prepare for the show, although Gary mentioned Jet and Cord McCoy, the cowboy brothers who were runners-up last season, as competitors he admires. "It's just mentally, physically and emotionally challenging," Mallory said. "There is no sleep, no food. ... You are just running, running, running." "It's just a rat race. It's hard but it's fun." Particulars of the televised adventure are totally hush-hush. During their telephone interview with the Herald-Leader, their public relations minders would steer the conversation away from any topic that might give away anything remotely resembling a show secret. The official line is that before it is all over, the winning team, which gets $1 million and will have traveled 32,000 miles over four continents, including visits to Bangladesh, Ghana and the Arctic Circle. Sunday's episode has the team visiting Ghana. As for a strategy moving forward, the Ervins had a plan: Keep in the good graces of their fellow contestants. Gary said, "If you are pain in the neck, you can get thrown off." 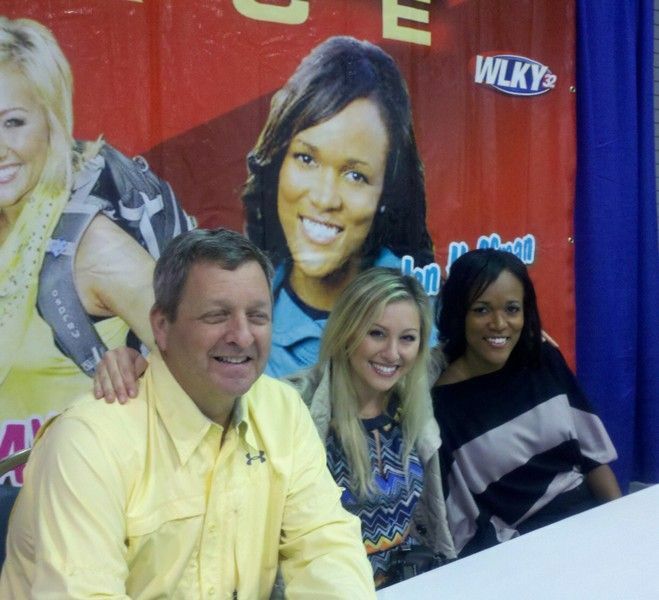 •Also of The Amazing Race Jennifer Hoffman and Gary and Mallory Ervin on Sunday from Noon-5 p.m. in the North Wing. I swear Gallory better win just because of their integrity and love for the game. I have seen someone more excited to be on the race just to experience other cultures than Mallory!